Newton’s laws of motion and gravitation and his invention of calculus best represent the first domain. Here we see the inseparable relationship between physics and math, “the bedrock that the world of physics is built from.” When we come to one of Newton’s less well-known pursuits, optics, we see how his interest in light waves anticipated James Clerk Maxwell’s work on electromagnetic fields. After this initial connection, the proliferation of subdisciplines intensifies: fluid mechanics, chaos theory, thermodynamics... the guiding force of them all is the study of energy in various states. The heuristics of classical physics prevailed, and worked perfectly well, until about 1900, when the clockwork universe of Newtonian mechanics exploded with new problems, both at very large and very small levels of description. It is here that physics branches into relativity and quantum mechanics, which Walliman explains in brief. While we are likely familiar with the very basics of Einstein’s relativity, quantum physics tends to get a little less coverage in the typical course of a general education, due to its complexity, perhaps, as well as the fact that at their edges, quantum explanations fail. While quantum field theory, says Walliman, is “the best description of the universe we have,” once we come to quantum gravitation, we reach “the giant Chasm of Ignorance" that speculative and controversial ideas like string theory and loop quantum gravity attempt to bridge. Great presentation. I wish you could create one that maps out the strengths and weaknesses of the more important interpretations of quantum physics and how the new age writers may stretch these to back up their attractive but questionable speculations. Cheers! Just Brilliant! More please…my students will love it. Thank you. Excellent presentation. Looking forward to more like this. Love this! Is a printed map available? From a physics ignoramus: wonderful stuff ! Truly fascinating. Excellent, thank you! Now I understand everything …. I see Theology (the reason Harvard and Yale were founded) was squeezed out of the picture. Interesting. I like this map. But what about this pic of the visual spectrum. Why is there a blue light in the upper part? It is a very tiny thing in this great work but is ist possible to change it? Very grateful you took the time to pull this together. One of my favorite books growing up was ‘Thinking Physics’ which tried to distill concepts into illustrations and asked questions to see if you really understood the concepts. Not sure where you’re going with this but I hope you continue to produce content like this in the future. Thanks, again. Long retired from mathematics, you’ve reminded me of how much I enjoyed the ah ha moment. I’m using the other side of my brain now but enjoyed your presentations. I liked your presentation on physics 101. I am particularly interested in quontom physics. Disclamer, I do not have a background in physics but am fascinated in leaning about dark matter. I read somewhere that scientists discovered that dark matter has intelligence. My thoughts on this discovery is if we as humans are effected by dark matter. I would like to think that as these same quontom particulars pass through the universe that we could be connecting to the very thing we are exploring. This is the first time that I have ever responded to a site like this one but I felt led to ask you this question. It would be interesting to discover if we are not only living in a vast universe but that we are actually an intragal part of the universe. Hi… I liked your animation. I would like an animation about material science, maybe you can explain materials from atomic point of view to differents interactions between atoms and electrons. Thanks. Loved the video! The animated presentation is great. Looking forward to seeing more. 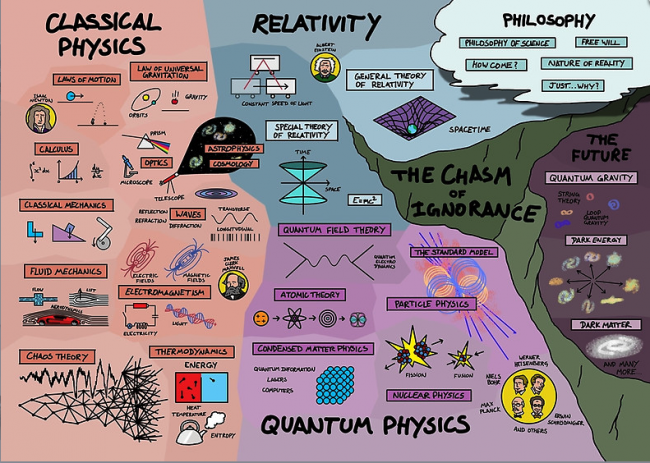 Physicist, artist, and all-around Renaissance man Bern Porter drew up a map of physics in 1939. It was cited and reproduced in the January 2019 issue of Physics Today (p. 30-37), as representing an outmoded view of physics, before the advent and rise of condensed matter physics (via solid state physics). The map was also printed as a frontispiece to one of the bestselling physics textbooks co-authored by Marsh White (College Technical Physics, i believe, from McGraw-Hill). Bern Porter had quite a history and along career, particularly in the arts, during his 93-year-long life. During World War II he had a small role in the Manhattan Project (he found out what it was for the day after the bomb was used on Hiroshima) and later in the Apollo Project. Meanwhile he claimed to have invented mail art, hung out in Gertrude Stein’s salon in Paris, befriended and then published Henry Miller and Anais Nin, and went on to a long career as an avant-garde artist with “found poems” and many other projects. and there’s more if you search.